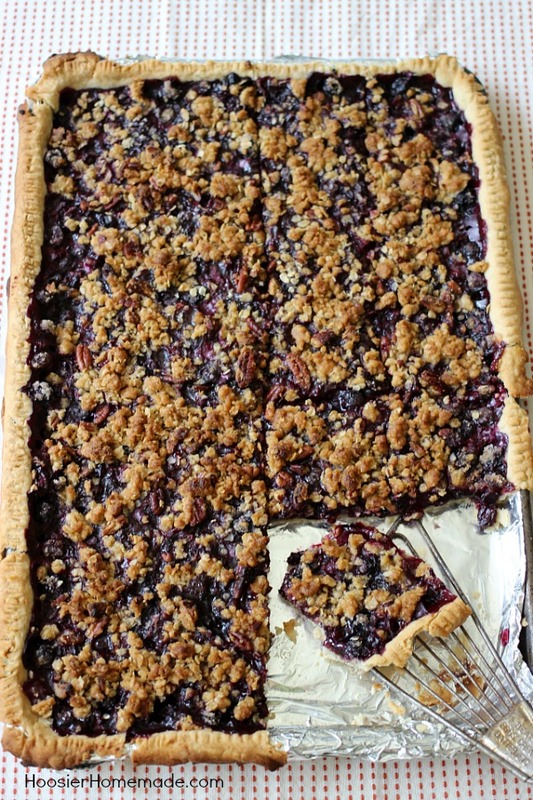 This flaky, single layer pie crust is filled with plump, juicy blueberries and topped with a crumb topping with pecans. 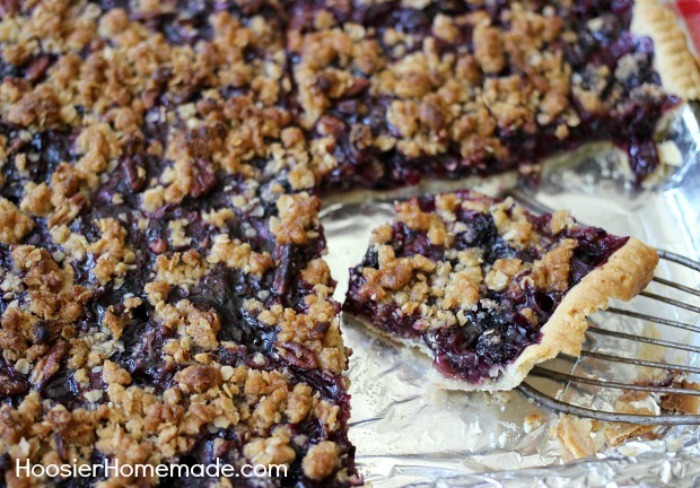 Blueberry Slab Pie is perfect for your Summertime Parties, Father’s Day, Fourth of July or take along to a Potluck. Slab Pie – it’s like a regular pie, except it’s bigger and better. It’s baked on a rimmed baking sheet and filled with a fruit mixture. 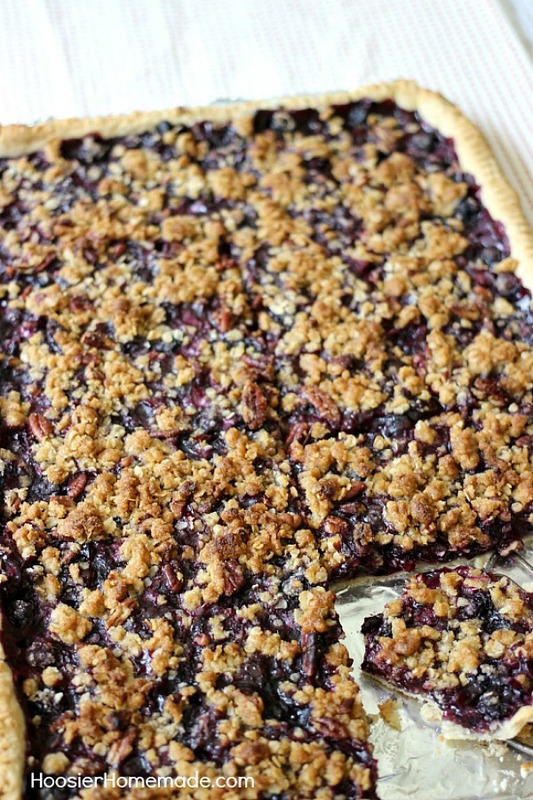 This Blueberry Slab Pie is topped with a mixture of brown sugar, oats and pecans, giving the pie a little crunch as well. From a very young age, I knew what I wanted to be when I grew up…a homemaker. I know that may seem strange in this modern era, but I really do love everything about taking care of my family and my home. I’m also very blessed to be able to have found a job that I can share my passion for homemaking with others. My parents were the ones that gave me the passion. There wasn’t a day that went by that my Mom and Dad didn’t spend in their yard and garden. My Dad worked tireless hours on his hands and knees tending to the garden and my Mom would use the vegetables and fruit that he grew to cook for her family. My Dad loved dessert, but especially pie. When I saw this Blueberry Slab Pie in a magazine, I was reminded right away of him and his love for his garden and for dessert. The pie is also an old fashioned type of dessert, which fits my Dad very well. He was a strong, tough man, but had the heart of a tender lamb. He would do absolutely anything to help anyone. When I think of pie, I first think of it as being a strong dessert, with it’s outside crust that covers it’s tender inside – kind of like my Dad. I’m thankful for the wonderful memories I have and for the life that my parents gave me. They definitely molded me into the women I am today. And I know they are my guardian angels watching over me and helping me succeed in following my passion. 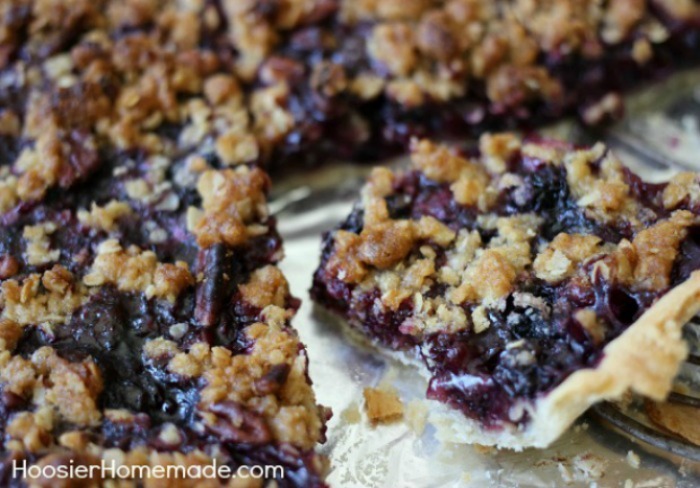 So whether you are celebrating your Father or husband on Father’s Day, hosting a Potluck or Cook-out, or even a Fourth of July Party – you MUST try this Blueberry Slab Pie! It’s not difficult to make, even for this lady who doesn’t make a wonderful looking pie crust. I have to be honest, I almost cheated a little and grabbed a refrigerated store-bought pie crust, but I’m so glad I didn’t. 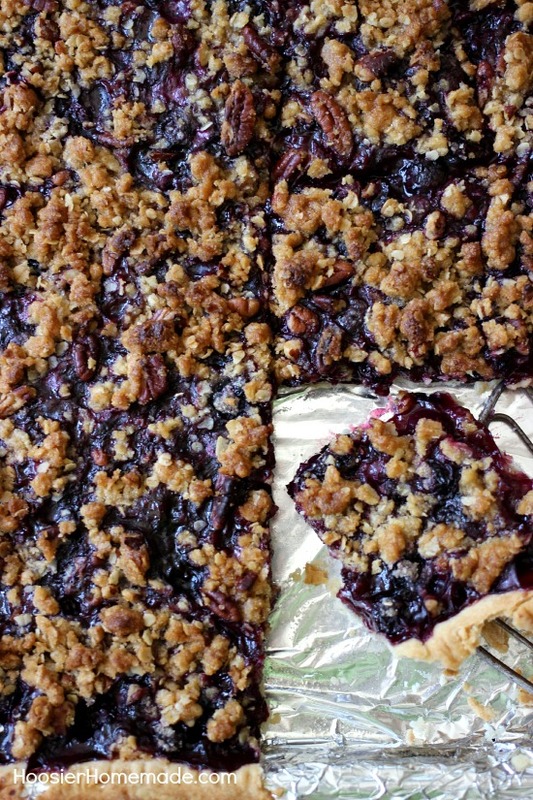 This crust is easy to put together and goes perfect with the blueberry filling. After rolling out the large crust, form it into a rimmed cookie sheet – like a jelly roll pan, about 15x10x1 inch. I lined my pan with foil to make it easier to cut and serve, just life the foil out of the pan onto a cutting board. Or you can also leave it in the pan, serve and have an easy clean up. The Blueberries are combined with sugar, flour (for thickening), cinnamon and lemon juice. Then the topping of oats, brown sugar, flour, butter and pecans is sprinkled over top. Into the oven she goes for 30 minutes for the delicious Blueberry Slab Pie. Just like a regular pie, except bigger and better. In a small bowl, combine sugar, flour and cinnamon. Add to blueberries and toss to coat. In a medium bowl, combine oats, brown sugar and flour. Add butter and mix until coarse crumbs form. Stir in pecans. Sprinkle on top of blueberries. Bake for about 30 minutes or until bubbly. I made this last year and it was delicious. I am going to a party an hour away this weekend. Do you think I can prepare and cook this before going there, or would it be best if I assembled and cooked it at their house? Hi Melanie, it will be totally fine to bake ahead. Just be sure to wrap it really well, maybe put a large heavy towel around it in case it spills over the edge. Thrilled you liked it, thank you! Oh, I am totally loving this dessert, and can see all sorts of other fruit working in it too! Such sweet words, too about your mom and dad! Pinned, and can’t wait to try this soon! I was so excited to see this recipe, mainly because i had so much company and having concern to feed them all. I made it changing the recipe with half strawberries and half blueberries. I also loved it so much and it was such a success that i decided to make it several times since! I had company that could not eat butter, so I changed the butter over to coconut oil and the folks loved it also. Thanks so much for posting this….I will put it in my favorite recipes! I plan to use this recipe as part of a red, white and blue desserts party for the 4th of July. However, I will use minute tapioca instead of flour to thicken. I have better luck getting a clear thickening than if I use flour. Hi there, the crust needs to be rolled to 19 x 13 to fit into the 15 x 10 pan. I did not try this recipe with a store bought crust, so I’m not sure. But I would think you would need 2 store bought crusts to fill the 15×10 pan. Thanks Liz . I will give it a try . So we need to stretch the 13x 9 crust to fit in the much larger 15x 10 pan right ? If you make the crust that I have for the recipe, it will be enough. If you are going to use a store bought crust, I would use 2 and combine them. Made this a couple of weeks ago, it was amazing!, I loved it as did several of my neighbors. . Thank you for a wonderful recipe, from one Hoosier Mama to another. So glad you like it Linda! Thanks for stopping by! I’m so excited, I just picked up a flat of blueberries!! Oh perfect Sue! I can hardly wait until we can pick blueberries here.